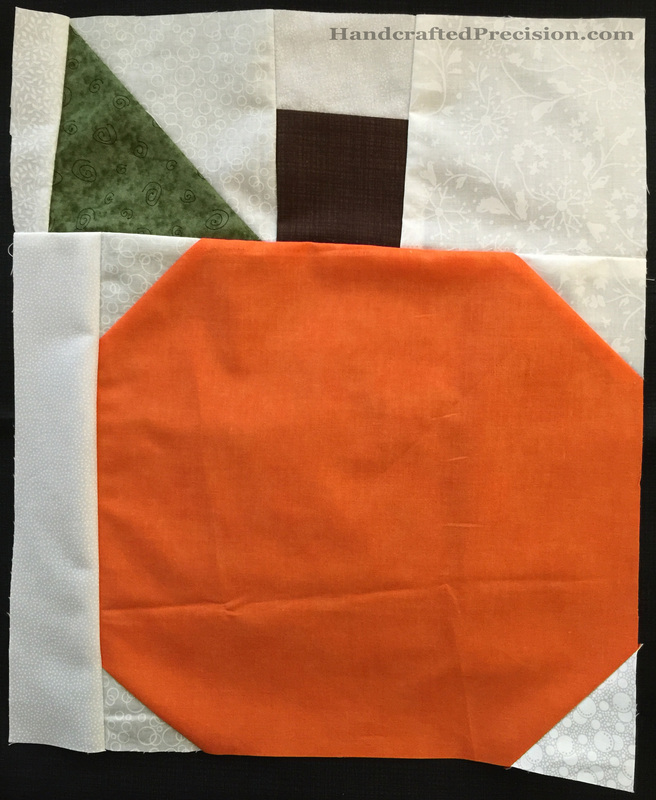 I used tiny (no bigger than 1.5″ square and many smaller) offcuts of the oranges I’d amassed for Sec’s pumpkin quilt and my planned ongoing scrap quilt projects. It’s curvy in the picture because it needs ironing. I thought that it was a terrible idea. Who has time to hand sew anything? I was there for machine piecing! And hexagons make the Grandmother’s Flower Garden and I hate that pattern and have no interest in doing one. But I saw a tutorial for this pillow and, though I’d never make that particular pillow, I did admire how it went together. I sat with the idea and it grew on me. Part of my problem with it was that those hexagons, both in the class and in the pillow, were just too big. Three inches on a side and six inches across for the class hexagon–why, I could machine piece those, if I had any interest in doing so. I bought some 1″ hexagons but they were also way too big. It would have taken too many stitches to join those together, though that size is definitely too small for machine piecing with my meager skills. I settled on the 1/2″, mostly because that’s the next-smaller size that the store carried. After working with them for a while, I think they’re perfect. They baste quickly, they’re super-portable, and the 1/2″ sides go together without too many whip stitches. They’re small enough so I can have a very scrappy effect, but not so small that a 1/4″ or 3/8″ seam allowance (I don’t know which I prefer yet) overlaps on the back and gets messy. Keep in mind that these are my VERY FIRST hexagons. They’re not neat at all. I cut the fabric with scissors (gasp!) and no template. I’m considering a template, especially if I’m going to fussy-cut a lot of them. I showed the diamond to Prim (my oldest son) and he said, “I like the tree,” so I think there’s a lot of fussy-cutting in my future. What am I going to make with these diamonds, which I envision doing in various colors? No idea. But it’ll take me a while to make a bunch of them, so I don’t have to decide yet. I do think I’m going to do a minimum of six in each color, probably not all at once, so I can get different fabrics mixed in, so I have plenty of time to decide what it’s going to be. Wall hanging? Pillow? Quilt? All maybes at this point. 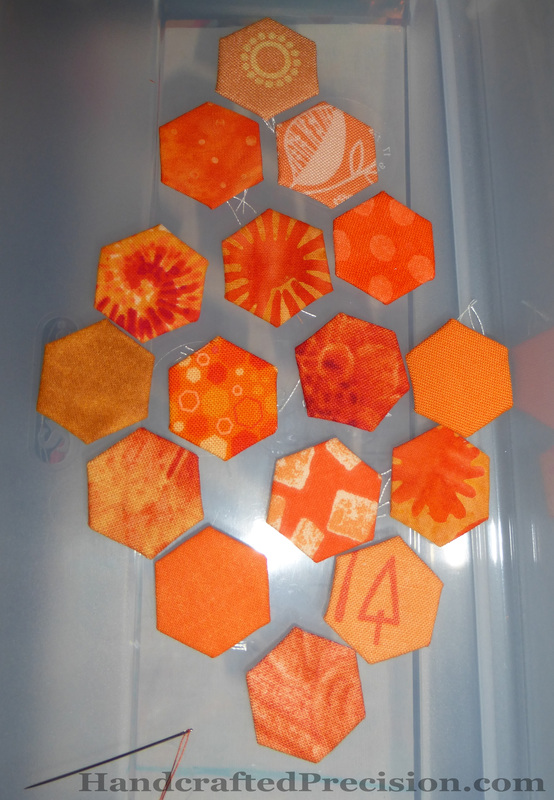 Part of what will guide my decision is how much I like cutting, basting, and sewing the hexagons. 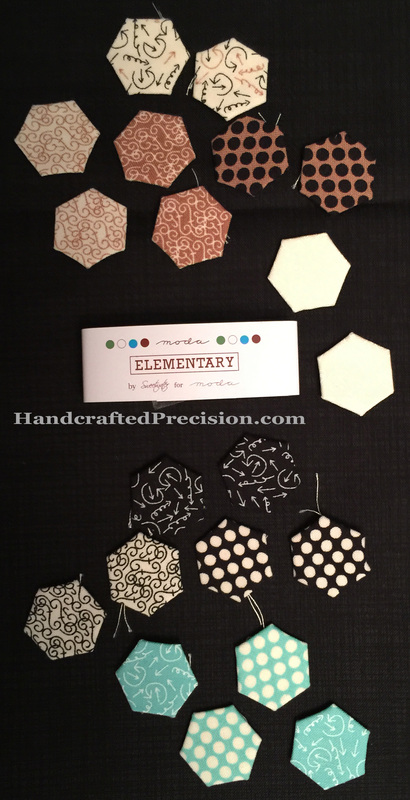 We’ll see, but I did order the big package of 1/2″ hexagons from Paper Pieces (I like supporting my local fabric store, but the markup on the small package of pieces was unreal), so it’s a good bet that I’ll end up at least at wall-hanging size. See that cat fabric in the upper right-hand corner? It was a scrap gift from my only sewing relative. I don’t love it in bigger cuts, but just one cat face is cute. 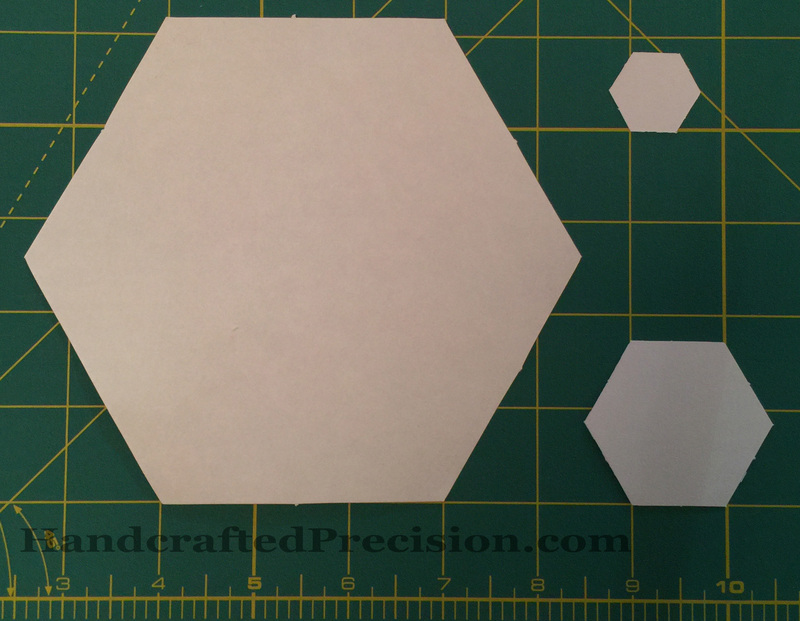 I don’t know if it’ll work for this diamond project, since it’s so stark, but I’m debating having a second, very scrappy, 1/2″ hexagon project going at the same time. I’ll probably just baste those hexes and throw them into a box and think about them later. Future me, they’re your problem! 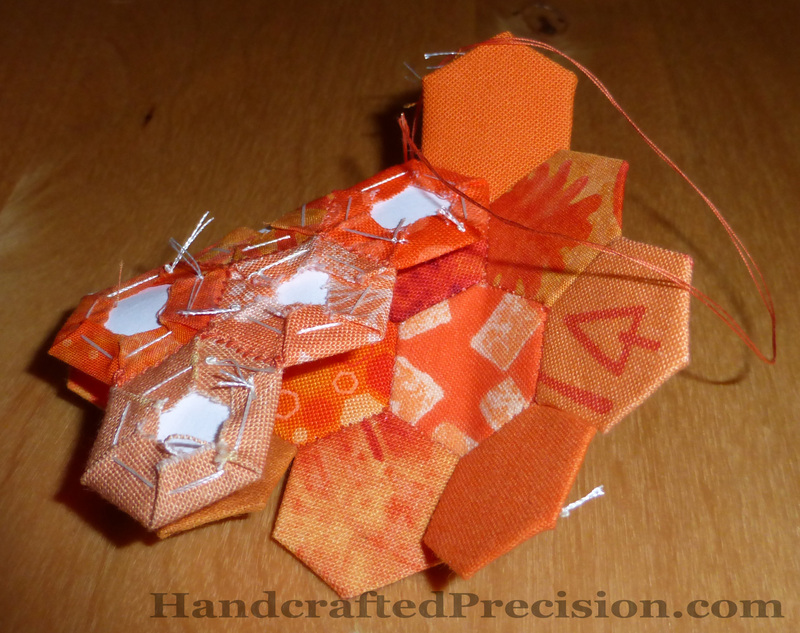 This entry was posted in English Paper Piecing, Hand Sewing, Hexagon Diamonds, Hexagons, Orange and tagged I'm Not a Machine on September 28, 2014 by HP. 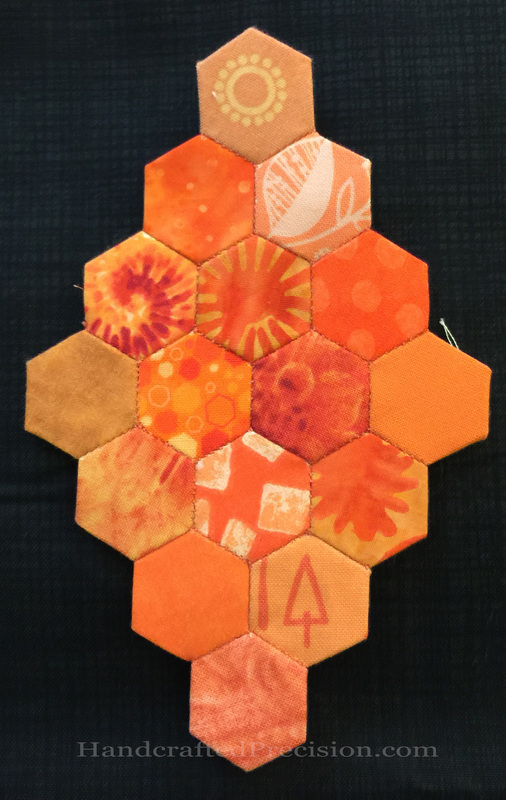 I decided on a layout for the (first) orange hexagon diamond and was able to work on joining the hexagons together. I say “first” because I think I’ll need at least six of each color for whatever this ends up being. Maybe a quilt? Maybe a wall-hanging? Maybe a wall-hanging that’s a quilt? Dunno. I also learned not to use the flash to take photos like this. Anyhow, the whip-stitching is going far better than I thought, though I think I need a smaller needle. The papers fold easily and I must have basted right, since the edges and corners are lining up. 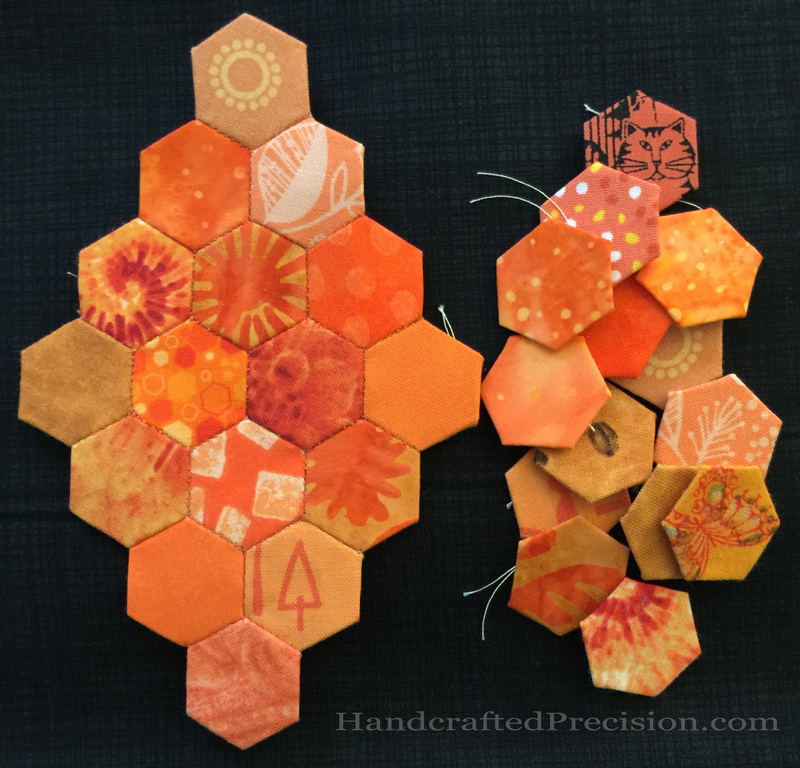 This entry was posted in English Paper Piecing, Hand Sewing, Hexagons, Orange and tagged I'm Not a Machine on September 21, 2014 by HP. Well, now I feel a little silly. Remember when I was talking about how no one has time for hand sewing and blah blah and why was it covered in the scrap class? I guess the reason was to plant a seed, because I came across this pillow tutorial at Sew Mama Sew and I realized that I didn’t like the hexagons from the class because they were too big. 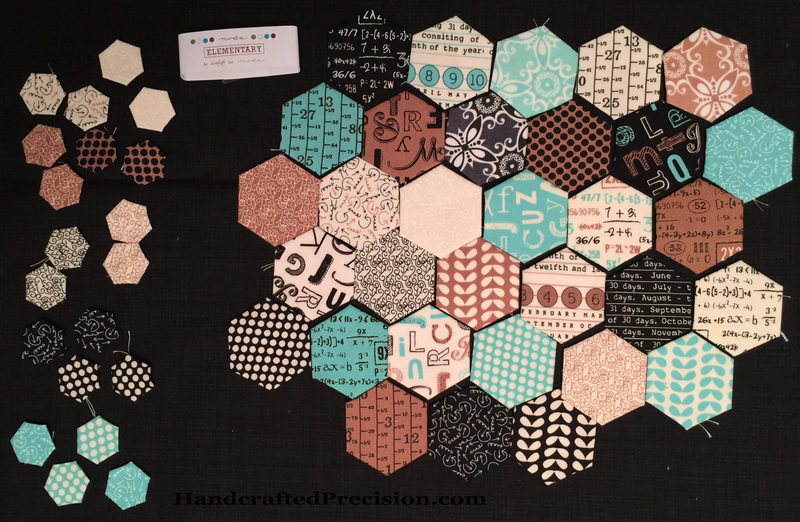 If I’m working with hexagons three inches on a side, I might as well machine sew them. It would involve Y seams (which I’m not interested in trying yet), but those pieces of fabric are being enough not to get chewed up by the machine (even mine). That, and I didn’t like the idea of basting through the paper. It seemed somehow inelegant to me. The pillow also showed me that hexagons aren’t all about Grandmother’s Flower Gardens, which is a pattern I’m aware of and don’t love. You can do diamonds! And other things! Plus, that pillow got me thinking about a Settlers of Catan pillow, since the game tiles are hexagons and that would look awesome. We have the game somewhere in the basement and I could either print the fabric at home or use Spoonflower–I’ve been wanting to try them but haven’t had a good excuse. In short, I think I’ve been bitten by the EPP bug. 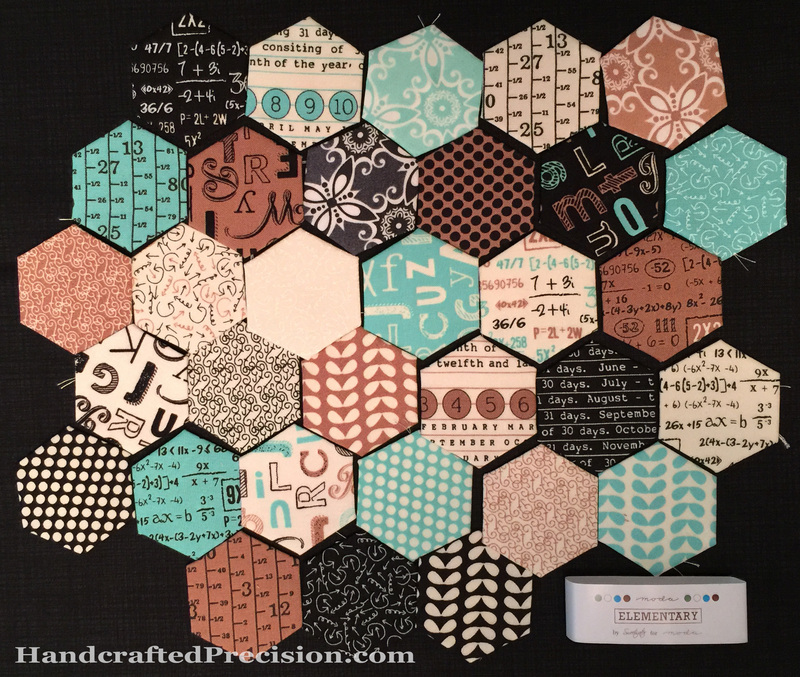 I went by the local fabric store and got some 1″ hexagons, but when I got them home, they seemed too big. I went back and got some 1/2″ hexagons, which seem perfect. I’m not sure what I’m going to use them for yet, but I’ve started playing around with the orange fabrics I got for Sec’s pumpkin quilt, and the few orange scraps from the eBay scrap boxes, just basting them around the 1/2″ papers and seeing how I like it. This looks like a possible layout, but I’m not sure yet. Prim walked by and said that his favorite part was the tree (on the lower right), so I may do more fussy-cutting, though the orange fabrics I have don’t feature much in the way of tiny motifs, besides what you see here. I do think I like the idea of being comfortable not knowing what I’m going to make (besides single-color diamonds in this size)–and knowing that the making will take a long time. I’m excited about the project, but also relaxed about it so I can enjoy seeing how it turns out. 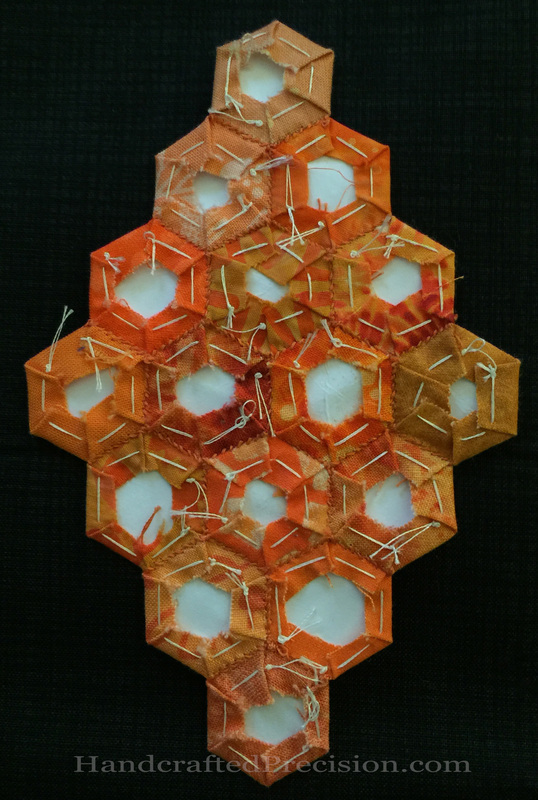 This entry was posted in English Paper Piecing, Hand Sewing, Hexagons, Orange and tagged Hexagon Diamonds, I'm Not a Machine on September 14, 2014 by HP. Seeing a distinct lack of orange in the scraps that I bought from eBay, I decided to buy some. Pretty, right? I needed way more oranges for Sec’s pumpkin quilt, and now I have them. Most of them are half-yard cuts, except when I got the bolt end. But buying these (and the rest from that order, which is not pictured as it’s not orange) was tedious, time-consuming, and frustrating. I’d ordered some fabric once before from Fabric.com (they don’t get a link because of my awful experience with them–keep reading), so I went with them again since I already had an account. I spent a good amount of time putting fabric into my cart, but I wasn’t able to checkout. When I hit the “checkout” button, the cart jut reloaded. I restarted my browser. No dice. I tried a different browser. Nope. I even restarted my computer, even though the problem clearly wasn’t on my end. Of course that didn’t fix it. So I contacted their customer support, spent a lot of time on hold, then explained the problem and said what I’d done to fix it. She couldn’t deviate from her script, which was frustrating, since it meant she couldn’t discuss the problem with me. She asked me to take a screenshot, even though I told her that it would just show the cart looking like the cart, but she insisted. So I took a screenshot of the cart and emailed it to her. A day later, after clicking on that stupid “checkout’ button a lot more and getting progressively angrier, I got a canned “we’re kicking it up to our engineers” email, but I knew it would go nowhere. I would have abandoned the whole thing, but I’d spent a lot of time picking those fabrics, most of which were on sale. Other online retailers had some of the prints, but not all, and I just wasn’t interested in looking through my lengthy cart and finding all of the fabrics somewhere else. I was ready to write the whole thing off, but I tried one last time and the transaction went through. I saw what the problem had been right away. Whatever module or system or service they use to calculate sales tax had broken, which made the whole transaction fail. This is ridiculous, since the sales tax was eighty cents or so on a very large order (which almost didn’t get placed). Any real ecommerce company would have let the transaction complete and eaten the sales tax. I did let them know that I was able to complete my purchase, but I never heard back from them. Once I contacted them about it, a good company would have apologized and given me a discount or a coupon or something, anything to make me less angry at them for wasting my time over their problem. I’m used to fantastic customer service because I buy almost exclusively from Amazon online. I wish Amazon sold fabric by the yard. Or precuts. Amazon needs to buy Fabric.com, like it did with Diapers.com. Fabric.com could use Amazon’s cart technology as well as its “You bought this on <some date>.” technology. Anyhow, that’s the tale of why I don’t like shopping with fabric.com. Storytime’s over. UPDATE (19 Nov 2014): I’ve been getting Fabric.com’s “deal” emails for a while now (because even though I said I’d never use them again, I have an account there already and inertia is a powerful force) and they very seldom have sales for more than 15% off, but they almost always have a 15% off sale going on, which in my eyes is like the electronics store perpetual going out of business sale. (Which is illegal.) Bottom line, avoid Fabric.com. 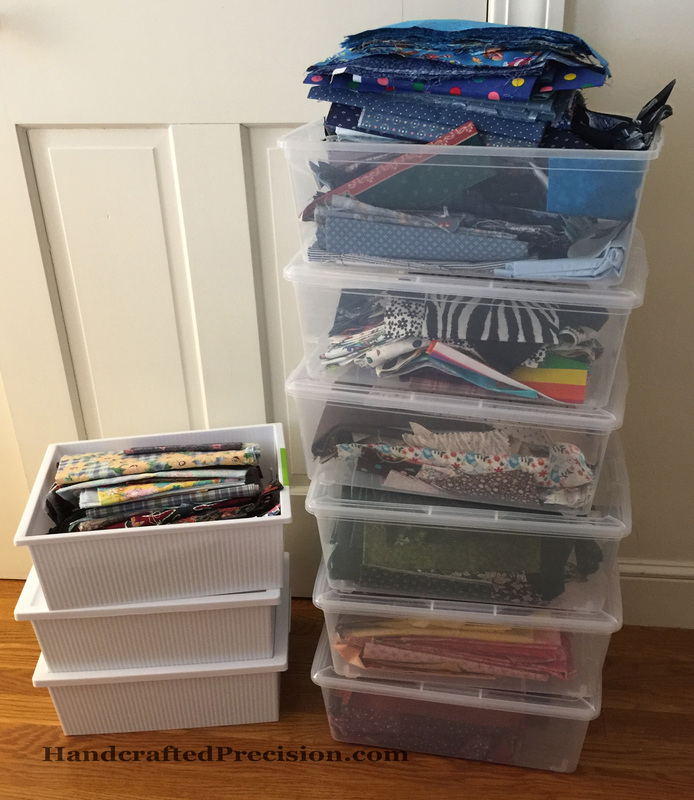 There are better online fabric stores (like Fat Quarter Shop and Connecting Threads), especially for quilting cotton. This entry was posted in Merchant Review, Orange, Stash on September 9, 2014 by HP.